Last week I did a post about Penn's new $43.5 million dollar addition: Penn Park. 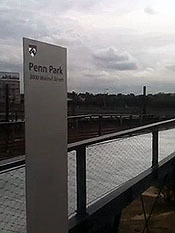 I will say that even after I posted the video and saw the pictures of this Park I had some problems understanding how one would get there on the Penn campus. Rest assured alumni who haven't been back to campus in a while; after the jump, Kelly Diamond (C'13), our DT undergrad correspondent has provided another one of her famous"15 second clips" which will put everything in perspective for you! Penn's campus continues to change. Alumni, if you haven't been back to campus in a bit, check out my 2009 video tour through campus.